Thank you for posting K5861 - this is indeed an intriguing puzzle. We don't have a solution to it, but given Sid Hollander's interest in "results of others", we thought we would offer a few observations that may contribute towards reaching a solution. 1. "Ik" elements are prominent: (a) large "Ik" patterns are on the left and right sides (as oriented onscreen); (b) there are two small "Ik" signs in each quadrant; and (c) the double column of calendric glyphs begins with 7 IK. Also, what may be "ka" glyphs at the base of each large "Ik" glyph may be phonetic complements to emphasize that the large red glyphs are to be read "ik." There is symmetry to the color coding: (a) Both glyph pairs at the rim (Rows 1 and ll) are red, but then opposing glyph rows as one moves toward the center are of opposite color (e.g., the pair in Row 2 are red, while those in Row 10 are white; the pair in Row 3 are white, while those in Row 9 are red; and so forth to the center, where Row 6 is white). We wonder if this apparently deliberate color-coding has something to do with the order in which the calendric glyphs are red (but we haven't been able to determine what that might be). 3. The two glyphs in each of the 11 rows do not appear to us to be Calendar rounds, as we see no Haab period glyphs. Rather, we see two columns of Tzolkin names. For example, several in the left column seem quite clear: A1: Ik; A4: Lamat; A7: Ix; A9 Etznab; and A10: Ahaw. The glyphs in the right column are much harder to read, but they appear to be Tzolkin day names, not Haab period glyphs. Examples: B4: Muluk; B8: Kawak; B10: Imix. There may be an effort by the scribe to use each day name once. In our tabulation, only Eb does not appear (Akbal is given as an alternative to Ben at B6, and only a very few glyphs appear twice). The coefficients range from 1 to 13, suggestive of Tzolkin dates. In our tabulation, 1 and 5 are used 5 times; 4, 9, 10 and 11 do not appear. 13 Ok at A11 (bottom of right column) has position 130 (the midpoint) in the Tzolkin calendar. We wonder whether the Tzolkin day names and numbers presented may function together with the red "distance numbers" in some manner (a) as in a codex almanac or (b) as a table to facilitate calculation of day names and numbers for short time periods (buk' xok). But our efforts to demonstrate either of these hypotheses have been unsuccessful. 7. We have also considered whether there are any patterns in the distances between the Tzolkin dates we have identified, but so far have been unable to discern any pattern. These comments may be of some help if they contribute to reaching a consensus as to day names and numbers (if there is agreement as to the nature of the right column! ), and perhaps a Listero with greater familiarity with almanacs and Tzolkin tables can make greater progress as to how the two columns are to be read. We leave it up to you whether our comments should be posted on Aztlan or in the Maya Vase section of the FAMSI website. In any event, working on this plate has been most enjoyable -- thanks for the opportunity. Hal Green, J.D. Falken Forsaw, Ph.D.
On 12 September you asked Sid Hollander via ATZLAN to give some comments towards the plate K5861 which is probably from the area of Campeche or Yucatan. ( The question was directed to all who wish to comment) This plate has rather fascinated us and for this reason we are writing to you in the hope that you can give us a few hints, taking into account of course that you yourself have in the meantime received more information. It seems to me (Julie) that the plate could have something to do with the burner days or rather the fire rituals, as far as the iconography goes. Firstly, to the left and right of the calendar dates the figures look like incense burners standing on small columns. The approx. 17 dots could be blood spots. Blood sacrificing was usually associated with fire rituals. Not all of the calendar dates are so easy to read. On one side the bars and dots are to the right (which is rather strange) and they are not exactly next to their day glyph making it therefore very difficult to pin-point down the correct date. Some calendar dates are red which definitely also has its reason. Below you will see a preliminary reading of the dates with a few alternatives. Taking into consideration that at least some day numbers are correct in the above list, the question is now whether the plate has something to do with the “burner” period (a 65-days sequence each with three 20-day intervals [V. Bricker]). I realize that estimating the iconography alone still does not explain The calendar dates. Andreas has come up with a few astronomical possibilities. One being the Saturn visibility. As there are 11 rows, this could belong to 11 synodic periods of Saturn (378.09 days), since 11 x 378.09 = 4158.99 days and 16 Tzolk'in are 4160 days. The one day difference was used as a correction day (similar to our concept of leap days). After one run through the plate the dates of the Saturn station would need a shift of one day. The analysis of the 22 dates in comparison to the period of Saturn results in a possible order of various Saturn stations (opposition, start and end of retrograde movement). Sometimes it is a problem to identify the glyphs, or to relate the numbers to a Tzolk'in name. At the end the general order of the Saturn stations was from top to bottom and left to right (as displayed on your picture), but sometimes extraordinary jumps are necessary. These jumps are confusing and make the Saturn interpretation less certain. On the other side the jumps might be the result of a second planetary involvement. As well known, the synodic period of Mars (780 days) are equal to 3 Tzolk'in, therefore only one Tzolk'in date for each Mars station would be necessary. Six dates in the middle part could represent all Mars stations. These dates would fit to two of the LC-date of the 780 day multiplication table (Dresden codex p. 58-59). After 17 Mars cycles a correction of 17x0,06 = 1.02 days is necessary to adjust the 780 day cycle to the mean Mars cycle (779.94 days) as indicated by the 17 red dots on the plate. Is it acceptable to identify the four red crosses as star glyphs (ek')? 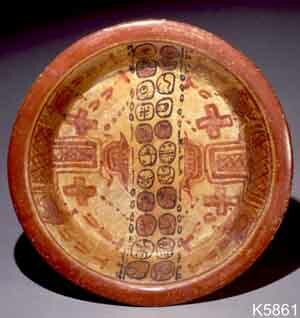 To date the Maya plate K5861 it is possible to compare the Mars opposition on day 5 Ix (1st row, 7th line on the plate) with the Tzolk'in date at 9.18.1.7.9 13 Muluk 17 Wo. 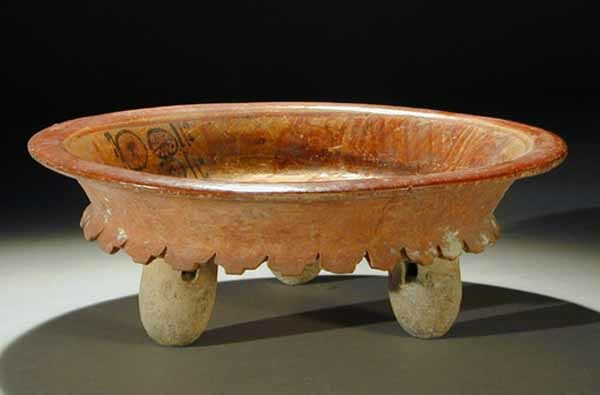 The shift of 5 days from 5 Ix to 13 Muluk would place the approximate date of the Maya plate about 184 Tun earlier at 9.8.17.0.0 (+- 37 Tun). So my questions would be: Is there any stylistic reason which would support this dating of the plate? What do you think about the planetary involvement? Artist to draw inside the plate?